Broken Beach and Angel's Billabong are two very spectacular places. I went there for the first time in November 2015, during my second visit to Nusa Penida. The road was a nightmare at the time. And it still is ! But the place really deserves to make the effort to endure a bad dirt road during a half-hour with a scooter or a chauffeur-driven car. Broken Beach and Angel’s Billabong are on the southwest coast of Nusa Penida. Not far from Crystal Bay. But to go there by scooter or car you have to make a big tour. And the road is the worst of all roads in Nusa Penida. You can also walk to Broken Beach from Crystal Bay, but the trail is not easy to find and it is a 2 hour hike. The local name of the place is Pasih Uug. But both places were renamed by an Indonesian blogger. And the names stayed because they are quite colorful and reflect pretty well the way nature has shaped the coast of Nusa Penida very dramatically. The place was named Broken Beach because it resulted from the collapse of part of the cliff. The collapsed part has a circular shape. And an arch was formed on the narrowest part that borders the sea. The whole looks like a circular bay with an arch overlooking the sea. But better than an explanation, look at the photos ! You will probably go around the bay and you will probably take a lot of pictures. But beware of selfies! Many careless tourists have gone too far to take their picture and have fallen (from high). Since then, signs warn visitors against the risk of selfies ! If you have a drone, try to fly high, to take a picture in eagle vision, it is quite spectacular. But don’t try to fly below the arch, we found many Mavic Pros there when we went diving … And if you’re lucky you may see some Manta rays from the cliff. Because the bay is called Manta Bay and this is where fishing boats bring you for snorkeling. A billabong is an Australian term which normally refers to an isolated pond left behind after a river changes course. Here, it is rather a natural pool embedded in the cliff. It is filled with clear water during high tide. And the natural pool appears at low tide. The water is very clear and it is quite fun to go for a swim at low tide. But when it is high tide, as soon as the first wave enters the pool, it is imperative to go out. I saw tourists being unbalanced by a wave. And they were lucky not to be swept away by the wave outside the pool, because then it’s almost impossible to come back. There are two options to go to Broken Beach and Angel’s Billabong. It takes at least three hours in total. But both places deserve the effort because they are part of the jewels of Nusa Penida. It is a two hour hike but the trail is not really obvious. And you need proper shoes. It is pretty easy to start. When you are facing the sea, at Crystal Bay, go to the left side of the beach. You will find stairs that go up on the hill and then down to Pandan Beach. Then it becomes a bit tricky to find the trail in the valley, in order to climb onto the other side of Pandan Beach. You have then to follow a contour line till the other side of the second valley. There is no clear path but if you have Google Map you should find the right direction and reach Broken Beach in less than 2 hours. Angel’s Billabong is right next door. Some people told me recently that they managed to reach Crystal Bay in scooter following a road shown on Google Map. But I never tried myself. Go to Broken Beach by scooter or car. If you are a good driver and if it has not rained too much the days before, then the scooter is a good option. Otherwise, take a driver with a car. From Toyapakeh, turn left after the village of Sakti (the right road goes to Crystal Bay). The advertised road is the first road on the right. You will then follow the indications. An alternative is to take the second road on your right leading you to Batu Madeg and to turn right just after Batu Madeg. You will at least avoid a very busy road, in a bad shape. But you will anyway have to face a nightmare during the last miles. The more you see people in distress coming back, the closer you are to Broken Beach. It will take around one hour in total to reach Broken Beach from Toyapakeh or from Crystal Bay. You will then have to pay an entrance fee of IDR 5,000 to access the site. What is the best time to go to Broken Beach and Angel’s Billabong ? Many tourists choose to visit Nusa Penida with a daily tour. And Broken Beach and Angel’s Billabong, together with Kelingking Beach, is usually part of these daily tours. It is therefore better to avoid the peak time of the visits, between 11 am and 3 pm. 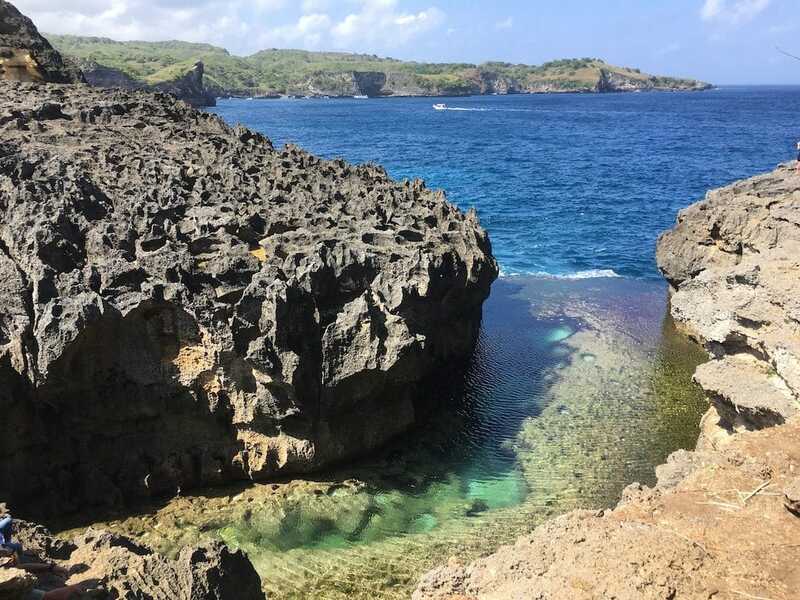 If you want to take photos inside Angel’s Billabong natural pool check the tides time table and choose the morning or the afternoon according to the time of the low tide. In any case try to leave Broken Beach before 5.30 pm if you are driving your own scooter because you certainly don’t want to drive back in the dark on this road.